albino beet harvest | eating with S.O.L.E. As harvest winds down I finally had time today to address the small beets harvested last week that were bursting from my refrigerator drawers. I decided to split the difference this year with my harvest; Half of my big beets and carrots were bundled up in peat moss and set in the cold room for storage, their wee companions have been patiently awaiting a brine bath and my attention. The other half of my harvest will stay in the ground for the season, which I am only now reminded I need to flag off the sites so when I am digging through a couple feet of snow to find those crisp winter jewels I will know where to dig! Today I put up a few jars of various beets and really did enjoy processing the albino ones. I used my favorite pickled beet brine recipe made with cane sugar, apple cider vinegar, hints of ginger, cinnamon and just a couple star anise for good measure. 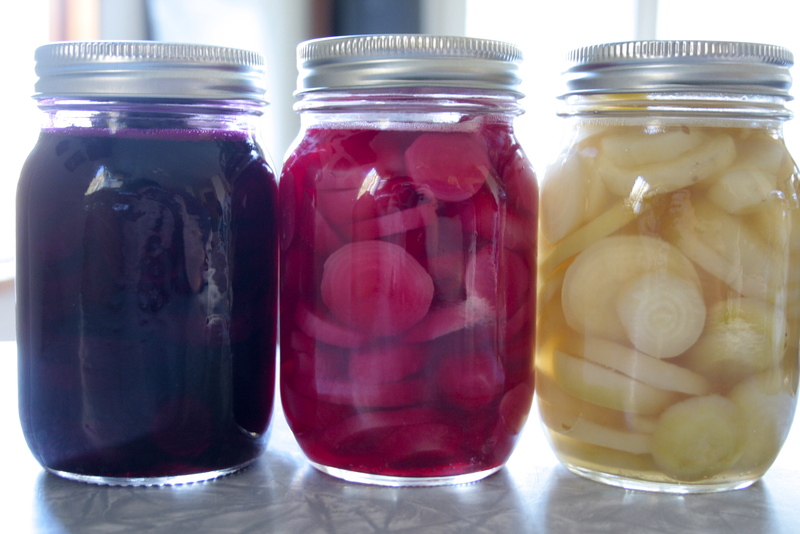 I kept the 3 varieties I was canning separate and ended up with 3 lovely and very different colored jars; the bulls blood beets are crimson blood colored, deep and rich as you expect to find with pickled beets. 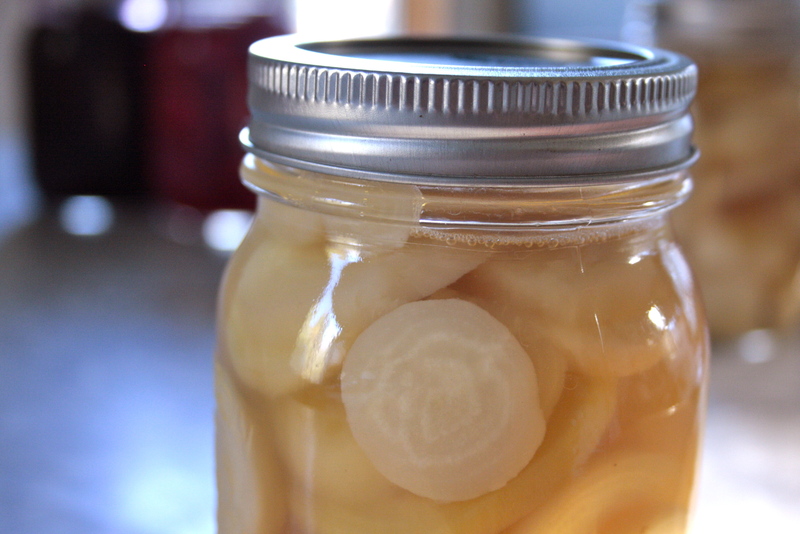 I also canned some chioggia “candy cane striped” beets, and then the albino ones. 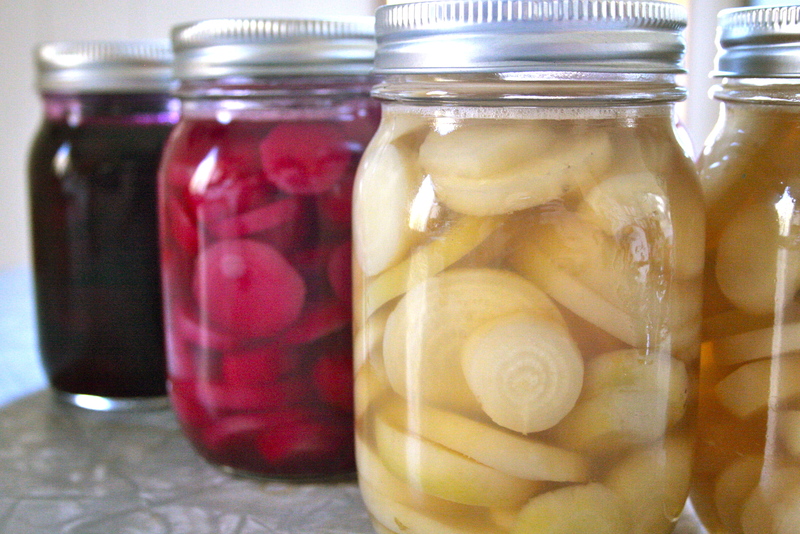 The chioggia beets made a light rose colored jar and the albinos were clear and a little ghostly. A few years ago I did some jars of beets where I mixed golden, chioggia, and a dark cylindra beet together in jars and found that when you came upon a pink stained golden beet in the pickled mix it looked off almost greyish and really not right, so I was pretty adamant I wouldn’t mix them ever again! I will certainly grow these little white beets again, if only for the ease of addition to just about any meal!